At this time of year we all look back at our victories and fails of 2014 and set new goals that we hope to accomplish in 2015. If running a Marathon is on your bucket list, we want to help you cross it off in 2015! That’s why we’ve just launched 5k to Marathon Progression Pack, an app bundle that contains the best training plan progression that will help you get to the starting line, even if you’ve never run before. This bundle includes four apps already used by thousand to accomplish their workout goals: Ease into 5K, Bridge to 10K, Half Marathon Novice 1 and Marathon Novice 1. After finishing these four training plans, you would have ran over 700 miles, spent 44 weeks training and you will be Marathon Ready. Ease into 5K: from beginner to 5K racer. Let’s be realistic. At this point, with no running experience, you’re not ready to race. You first need to build mobility and stability, while learning how to run without injuring yourself. The best way to do this is with a run/walk interval program, such as Ease Into 5K. With our app you’ll start at a slower pace, but you will be running a full 5k without walking in just eight weeks. This training program is excellent if you’re trying to adjust your busy schedule to a running routine. All you need is 30 minutes a day, 3 times a week to complete this training program. Now that you can race a whole 5K, you’re ready to focus on increasing your running distance. Let’s make it 10K! Bridge to 10K training program alternates between walking and running and is specifically designed for Ease into 5K app graduates. This training program demands a little more of your time – 3 times a week, from 53 to 70 minutes – but it will take you just 6 weeks of training to be able to complete a full 10K with no walking. Running 13.1 miles is challenging. Before starting to train for a half marathon, you need to possess a basic fitness level which shouldn’t be a problem after the previous 14 weeks of training. 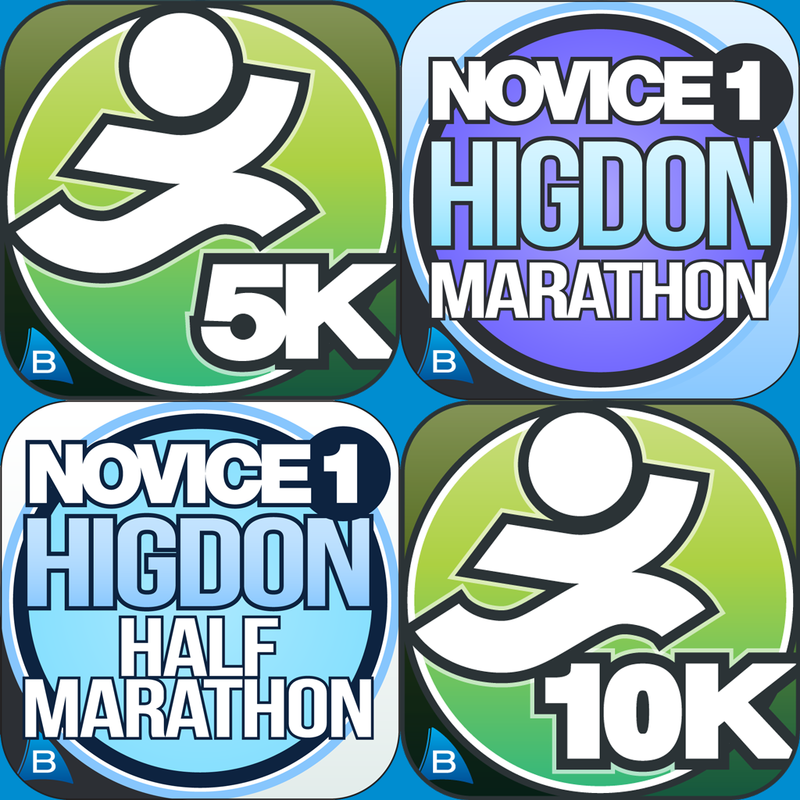 Based on Hal Higdon’s training plans, Half Marathon Novice 1 will get you ready to complete a half marathon in 12 weeks. To accomplish your running goal, you should run three days a week, cross train two days a week and allow your body to rest when scheduled. During this training program, you will be running two regular runs and one long run – 4 to 10 miles – each week. The Half Marathon day is also the last day of this plan. After 14 weeks of training you’ll be able to get to the starting line with confidence, which will give you a feeling of great accomplishment. Completing a Half Marathon will really give you an idea of what you’re capable of and motivate you to keep going further. That’s exactly what you need at this stage because now it’s time to prepare for the big 26.2. With Marathon Novice 1, you’ll train to reach this running goal in 18 weeks with the help of Hal Higdon’s running advice. Of all four plans this is the most demanding. You’ll need to run four days a week and complete two regular runs and one long run, that ranges from 6 to 20 miles. The plan finishes with the Marathon race day and a goal crossed off from the 2015’s bucket list! Download 5k to Marathon Progression Pack and get started today! Good luck with your training. If you already own some of the the apps in the bundle, you just have to pay the difference to complete the bundle. This entry was posted in iPhone App, Running and tagged 10K, 5K, Hal Higdon, Half Marathon, Marathon. Bookmark the permalink.